As I have mentioned in my previous blog entries, my friend and I was quite frustrated when we did not get to volunteer at all last Monday. It was, I believe, a glitch on the organizer's part that time plus the fact that way too many people poured in to help. We had no bad feelings to the station whatsoever, just the general feeling of failing. Flop di ba? 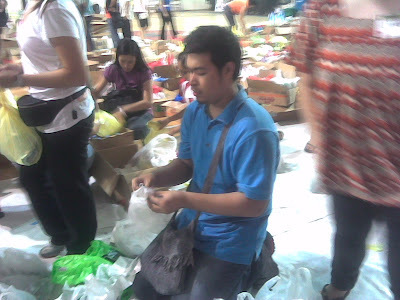 And so when another chance came again for me to volunteer, I grabbed the chance and well, held on tightly to it. Megatent volunteering was a second Flop but in my third try, I finally hit a success. What an awesome, awesome word. Together with Mando and Ida, and hundreds of other volunteers too at RFM Gym in Pioneer, Mandaluyong, we can proudly and strongly say now that we at least made our part in this whole Bayanihan system, we Filipinos, are known for. We have contributed, whether big or small, in giving aid to our fellow kababayans who were unfortunate enough to be hit and affected by the typhoon Ondoy (international name Ketsana). God bless everyone who lend their time to help in every way possible, either by donating or being part of the workforce. It sure made a difference. 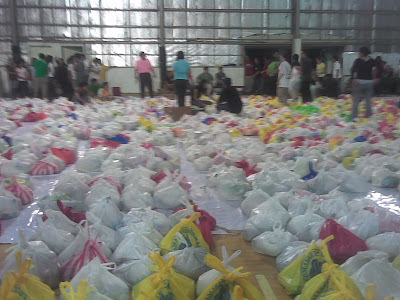 Relief goods packed waiting to be delivered.